Columbia Stiff Leg Davit Crane for Commercial Fishing Pier - Allied Power Products, Inc.
Special Features: This stiff leg davit crane was designed and manufactured by APPI to meet the Port of Ventura’s specifications. Their requirements included 14 feet of reach from the center of rotation and 23 feet of elevation above dock level with the boom fully elevated. The crane, unlike a typical davit crane or jib crane that relies on the base to stabilize it, uses three “stiff legs” to hold it in position. It features a manually rotated boom with an epoxy overcoat and stainless steel hardware for corrosion resistance. Four RAB light assemblies are mounted at the top of the mast to provide 24 hour usage. The Columbia HR3-2000-4A34-L AC electric hoist features a continuous duty gearmotor selected to meet customer’s speed requirement and a custom rotary limit-switch assembly with adjustable upper and lower limits for the 75’ travel distance. The hoist also features a cable tension roller, and custom overhaul ball above the hook to help prevent slack line conditions when not under load. The variable speed controls are housed in a NEMA 4X stainless steel enclosure with shielding to minimize internal temperatures during operation. An hour meter is mounted on the face of the housing to track usage of the system. A speed potentiometer on the custom NEMA 4X hand-held pendant control allows for both accurate positioning and high speed movement of cargo. In addition, a separate fiberglass enclosure houses a customer supplied key card security system to prevent unauthorized use of the crane. 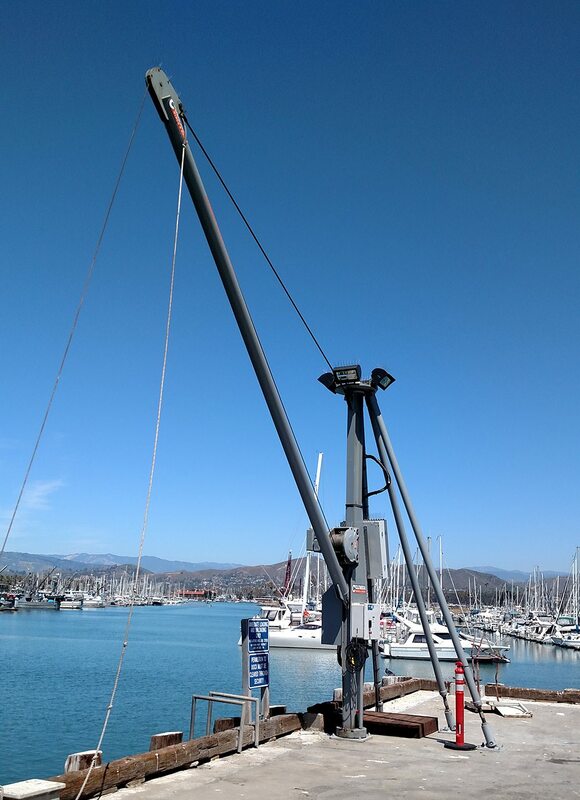 Why APPI: The Port of Ventura had an aging stiff leg davit crane system that had performed well for fishermen offloading catch as well as assisting in raising and lowering vessel parts needed for refurbishing. After considering a number of options APPI was selected as the supplier based on the design they conceived for the crane. The crane was subsequently manufactured in Oregon and shipped to the site for installation. Please contact us if you would like more information about this particular stiff leg davit crane or any of our other products and services.